"Rom’s Restaurant in Sturbridge has closed, according to Romaldo Roscioli, who with other members of the Roscioli family owned the place. Rom’s was in business for 56 years, according to a press release. The release also reported that Romaldo’s at the Hearthstone, Route 20, Sturbridge, would open later in the fall. Romaldo’s reportedly will feature a menu similar to Rom’s. Romaldo Roscioli said he could not comment on the closing of Rom’s or the opening of the new business." It is a sad day when an institution like Rom's throws in the towel. I wonder what the reason is for the relocation? I don't think it is lack of customers. I presume the offer to sell the property on 131 was just to good to pass up However, they will be sorely missed at the old location. I agree. Roms is a very special place to many of us. Weddings, special occassions, and of course the pizza with team! We miss you already! It's sad that after 52 years, a business that is well known and loved in the community is closing, but let's not make it more negative than that. There is no mystery to it; they didn't 'throw in the towel' which implies surrender. They don't lack of customers and they have weathered upturns and declines over 50 some odd years - they were very successful and remained so. Didja ever think they just wanted to downsize the business? Family owned businesses, especially one that has had such great success and following as long as they have don't last forever. Nothing does. I applaud Rom's for being such a huge staple in this community; for making a smart move that can be more easily managed, and for staying in Sturbridge. We bought our first lobster roll in 1977 at Rom's when we were tourists from Arizona. Later, we moved East and gave Rom's our business any time we were in the area. Yesterday, we drove over and found out the sad news. It's just losing another piece of our past. Our best wishes go out to the people who gave us so many great meals. We were planning our annual trip to Sturbridge for this October (2009) and were saddened to learn that Rom's had closed last year. Every time we visited Sturbridge, we enjoyed the scrumptous food that the restaurant provided us. Our favorite was the Thursday Night Special. We will miss the great meals and service, but we will always retain the fond memories. Check out the Hearthstone Inn and Romaldo's Restaurant on Main Street in Sturbridge. The family, and menu live on!! I just stopped in Sturbridge largely to have lunch at Roms...was I shocked. We had lunch at the mexican place that opened there...nice place...but no Roms...I had to google what was going on..good to hear there is still a Roms open...have to try it next visit. Just saw that Rom's closed. What a shame. We need more places like it instead of less. Roms food can be purchased at McNucks Market on Main Street in Fiskdale, and the Roms menu, prepared by the Roms cook, can be had at the Hearthstone Inn on Main Street. And, one more thing, many of us here in town do miss Rom's, but having the foods we remember still available is great. give both the locations I mentioned above a try. The dishes are just as you remember them. In the sixties we summered on Lake Quacumquassett (sp?) and the trip to Rom's for the all you can eat buffet was the highlight of the week. I went back several years ago with my son and was pleased. I amglad that I shared this memory with him. Ed, thanks for sharing your memories with us as well. 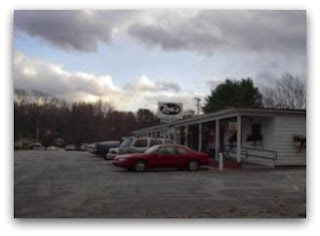 MY RELATIVES USED TO OWN THE INDIAN VILLAGE RESTAURANT AND MOTEL IN BRIMFIELD MA ON ROUTE 20 LONG AGO. AFTER GETTING OFF WORK I WOULD LOOK FORWARD TO A GRINDER FROM ROMS. GREAT MEMORIES OF SUMMERS SPENT GROWING UP IN BRIMFIELD. So many great memories. Thanks for sharing yours. Rom's had amazing meatballs, spaghetti, and garlic bread. Their take-out fried chicken and meatball burgers: totally awesome. Stopped there yesterday after we visited Sturbridge village to pick up some Italian cookies my wife fondly remembered. We couldn't find the place and later discovered that it closed 9 years ago! What a shock! Had many a lunch there with my family. A little further down Route 131 the Roms family has a store that sells many of the treats you fondly remember.